Save 10% every third order! Designed to fuel a healthy, active life, without breaking the bank! 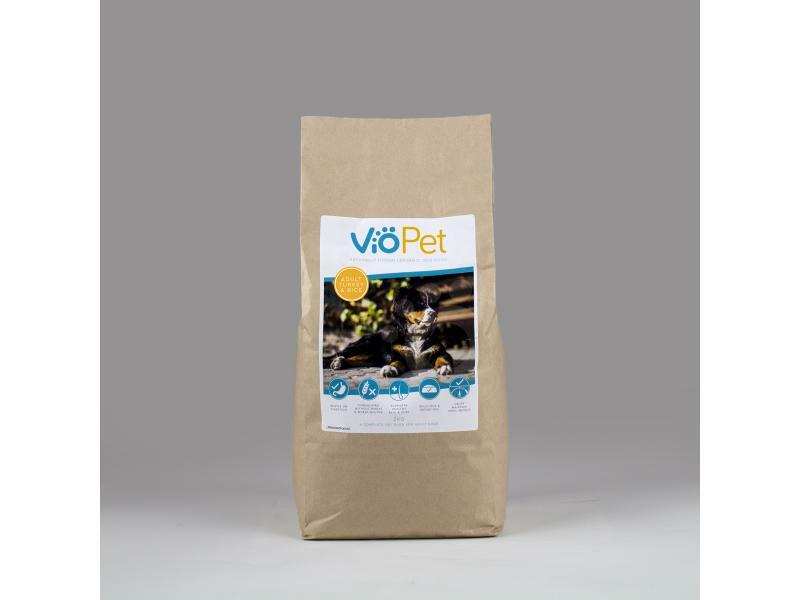 VioPet Adult Dog Foods are naturally hypoallergenic, wholesome and delicious recipes for dogs of all breeds. Gentle on the digestion - highly digestible sources of protein and carbohydrate ensure your dog gets the most from its food, without putting stress on the digestive tract. Ingredients rich in fibre help in the proper formation of healthy stools which are easier to pick up - yes, we went there! Free from wheat & wheat gluten - VioPet Adult Dog Foods are free from common problematic ingredients known to exacerbate skin issues and digestive sensitivities. They are suitable for dogs with allergies to the following ingredients: Beef, Pork, Wheat, Wheat Gluten, Dairy, Egg and Soya. Supports healthy skin & coat - formulated with added Omegas 3 & 6 to nourish and reinforce the skin and promote a glossy coat. Delicious & satisfying - we know your dogs will love the taste and with the inclusion of oats & beet pulp to up the fibre content, they’ll feel fuller for longer too. Helps maintain ideal weight - we only use high quality meats that provide a full range of amino acids needed for building lean muscle. The energy source that fuels their everyday life comes from rice, an easily digested and wholesome carbohydrate. 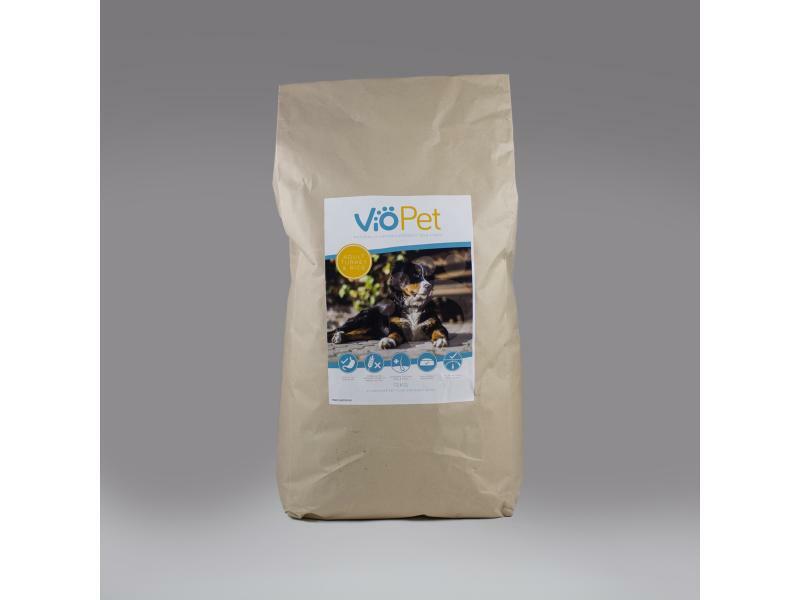 If you like our VioPet food, take a look at our VioPet Training Treats and Natural Treats! Turkey (30% including Dried Turkey, 4% Freshly Prepared Turkey, Turkey Fat), Rice (26%), Oats, Whole Linseed, Poultry Stock, Beet Pulp, Alfalfa, Minerals, Vitamins, Natural Seaweed, Omega 3 Supplement, Chicory Extract, Calcium Carbonate, Yucca Extract, Dandelion. Crude Protein 22%, Crude Oils & Fats 9%, Crude Fibres 4%, Crude Ash 7%, Omega 6 1.9%, Omega 3 0.7%, Calcium 1.4%, Phosphorus 0.8%. Metabolisable Energy: 330kCal/100g. Please be aware that this table is a guide and each dog will have different requirements due to factors such as age, activity level and size. When introducing a new food, we recommend doing so gradually over a period of 7-14 days. Ensure clean, fresh water is always available. Below are some recent questions we've received regarding VioPet® Adult Turkey & Rice Dog Food, including answers from our team. Wishing my old racer less poop and more power! My 7 year old greyhound is currently being fed Country Values greyhound food which I am pleased with for some aspects (price, palatability, non-wind producing) but it does result in a high volume of soft stools. Plus I am concerned that he has depleted energy levels (even for his breed!!). He has been checked by the vet. Do you think your food might be good for these two concerns? Does it produce lower stool volume? He is currently taking Yumove alongside Onsior from the vet for arthritis (I realise that the arthritis may contribute to the reluctance to move but I am trying every avenue to give him a better quality of life including looking into diet) thank you. I've compared the ingredients and I think VioPet would be a good diet for you to try. Country Values is lower in protein and primarily made from cereals and meat & animal derivatives, and these sorts of diets often lead to high volumes of stools, and due to the lower fibre content, they're often softer. Our VioPet recipes are intended to be highly digestible, so dogs get as much as possible from the food, leaving less 'waste'. We have ingredients that are also naturally high in fibre and help with stool formation - you'll hopefully see a difference in stools within a few days. He will benefit from the higher protein content too - this will provide an ideal source of energy for him, as well as the rice, which is an easily digested carbohydrate. I'd recommend introducing it slowly, over about 7-14 days, slowly increasing the ratio of old to new food. This will allow his digestive system to adjust and minimise any digestive upset which can be brought on by a sudden change of diet. I hope he will enjoy the food and you'll see the benefits soon :-) I'd love to hear how he gets on! Is this product suitable for both my 18 month collie and my 8 yr old retriever, or do I need different aged bags? If your 8 year old retriever doesn't require a specific diet such as a lower calorie one (if they are slightly less active as they get older) then they can certainly both go on VioPet Adult Dog food. Some senior diets have the addition of joint care ingredients such as glucosamine and chondroitin in low levels but I can see you already buy Yumove, which is perfect, as it will provide a much higher level of ingredients needed for joint health. Does the food contain any glucosamine or any other joint friendly compounds? Our current formulation doesn't contain any additional joint care supplements but we will be looking to expand our range of diets in the near future. Unfortunately, most diets with joint care ingredients don't contain enough to make a huge difference to dogs with existing problems, but they do help to maintain joint health as dogs age. We have our own brand joint supplement called Joint Force which contains all of the key ingredients such as Green Lipped Mussel (a source of Chondroitin and Omega 3s), MSM and Glucosamine but also has Turmeric and Boswellia Serrata which are traditionally used for their anti-inflammatory properties. I've seen that Penny and Daisy are currently taking Previcox - if you wanted to add in a supplement, they could safely take Joint Force with their medication. We've got lots of customer reviews if you wanted to see how other people's dogs have got on with it :-). Which country is the meat from and is the product made in England? Both the freshly prepared turkey and the turkey meal are from UK farms, and the product itself is made in Lancashire, England. Hi, could you tell me the size of kibble? I have 4 dogs, 1 being a smallish breed and very fussy, so not a lover of big kibble! 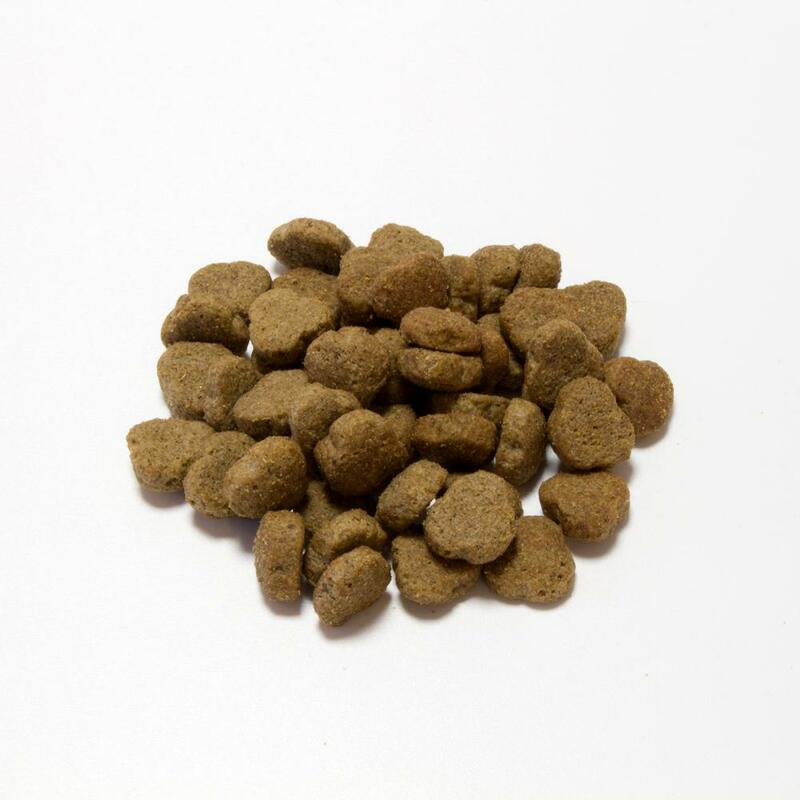 The VioPet Adult Turkey & Rice kibble are approximately 12mm x 5mm, so they're quite an average size for an adult kibble. 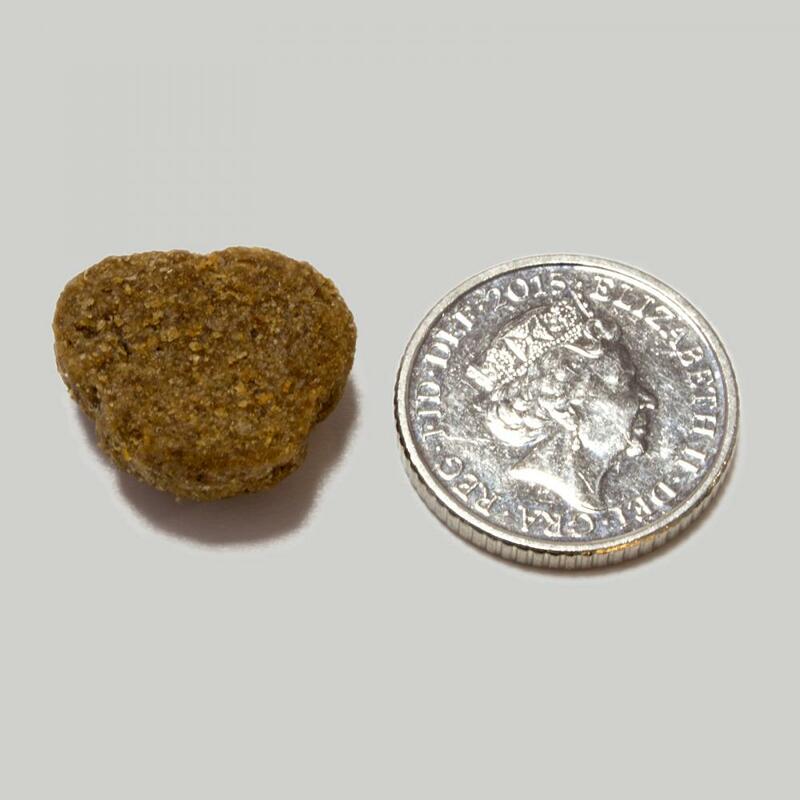 Here's a photo of the kibble next to a 5p coin. I hope this helps! I have a greedy husky and a fussy terrier, and I'm really pleased that they've both been enjoying this food. Our staff dogs are chief tasters and VioPet food had to get past the picky ones too!